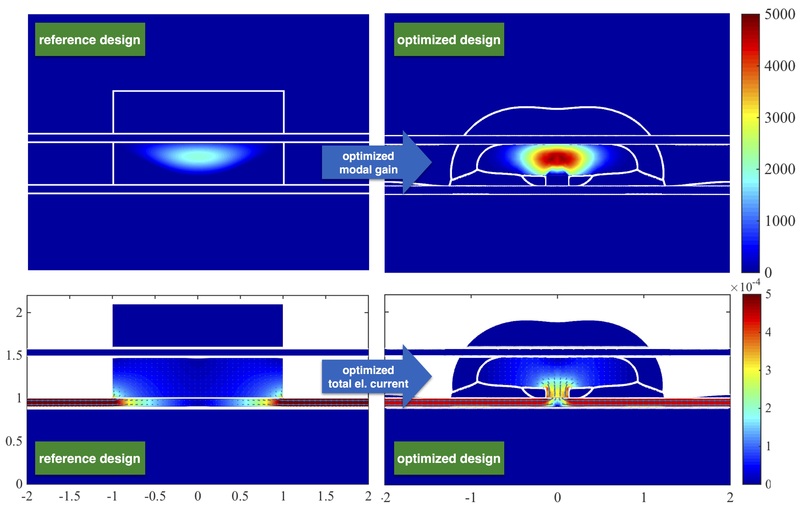 The goal of the iMatheon project D-OT8: Modeling, analysis, and optimization of optoelectronic semiconductor devices driven by experimental data is to optimize the design of a strained germanium microbridge with respect to the light emission. In the funding period June 2016-December 2018 we will develop tools for the parameter identification and optimal design of experiment for optoelectronic applications. The project also involves the close collaboration with the Department for Materials Research at IHP (Leibniz-Institute for Innovative High Performance Microelectronics, Frankfurt Oder). A cross-section through a typical material design of a strained microbridge is shown in Figure 1. The key idea is to increase the optical gain by applying a strong mechanical strain together with high doping. The dependence of gain on strain is captured by tight-binding calculations developed at IHP in collaboration with Pisa University [R2]. These results are included into van Roosbroeck-type models for semiconductors and equations for the optical field [R1] by an upscaling procedure . Further details can also be found in publication  from the WIAS Annual Research Report 2015. Linear elasticity (1d) can be solved independently. The strain e and doping C then influence the band-structure and optical gain g.
For details about equations (1a-1f) refer to [R1]. One important detail in the model is the dependence of the gain g on the strain, which can be found in recent works by our collaborators Virgilio et al. in [R2]. Joining both approaches by upscaling is a topic of our recent publication . The biaxial strain used there matches with experiments and theory from [R3]. Within the Matheon project OT1/8 we determine the optimal design of a Ge microstrip based on the optimization of optical properties (the photonic cavity and the optical mode), of mechanical strain, and of the doping profile. 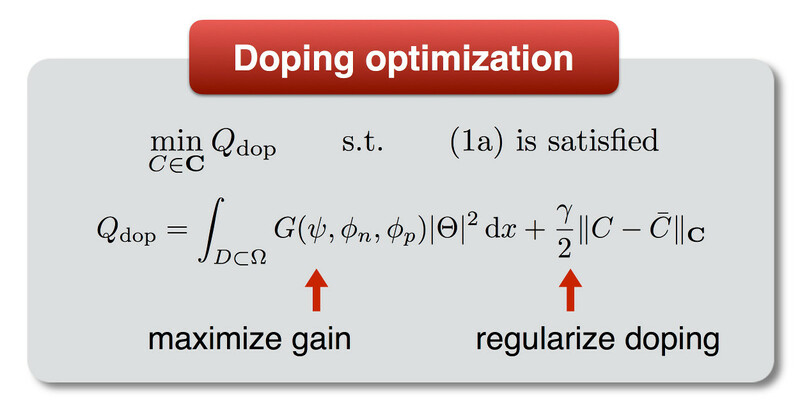 Due to the complexity of the underlying system, the shape optimization and the doping optimization are carried out separately. based on which the device design will be optimized. 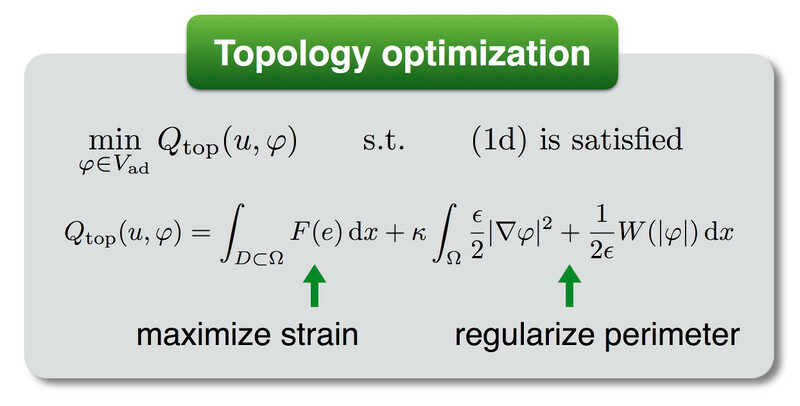 Topology optimization: The aim here is to determine an optimal configuration of the given materials within a domain Ω such that the band-gap is minimized by maximizing a suitable strain F within a given optical cavity D while adhering to a small strain setting. For the modeling of this, a phase-field approach is chosen, i.e., the fraction of each material within Ω is given by the corresponding component of the phase-field vector φ. Doping optimization: The goal is to find an optimal doping profile C, for which the (negative) net-gain G=l-g containing gain g and losses l is minimal, so that we achieve the largest possible net-gain. We only need to achieve large gain in regions, where the optical mode Θ is localized, which is why only the overlap GΘ² needs to be maximized. However, one still needs to study the dependence on the regularization, i.e. on γ, C and the reference doping C.
The doping optimization attempts to improve optoelectronic features of an design, where cost functionals could be designed towards delivering high modal gain or low electrical currents (for instance at a fixed bias), the latter leading to doping configurations capable of creating doping pockets that guide the electrical current into the center of the optical mode, see Figure 4. Figure 4: Different optimized dopings (left) reference (middle) gain oriented (right) current oriented goal. Here we highlight some exemplary results for the topology optimization of germanium microbridges. Figure 3: Different device topologies (left) reference microbridge (right) optimized microbridge cross section showing (top) phase fields and (bottom) strain fields. 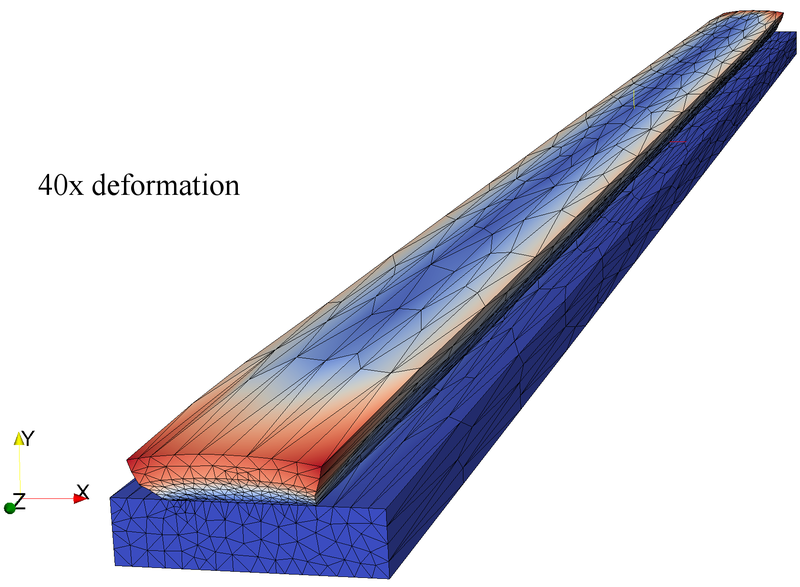 The topology optimization produces improved device designs with large strain in the germanium cavity showin in Figure 3. 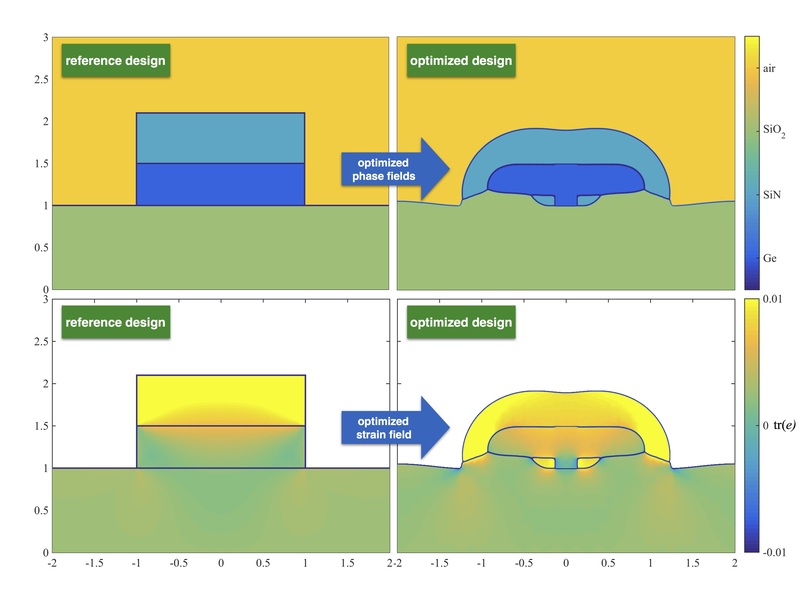 The reference design with top SiN stressor (left panel) can, using a similar sized germanium cavity, be improved by an all-around-stressor design (right) obtained by the topology optimization. As desired, Figure 4 shows that the optimized design has significantly higher modal gain (upper panels) when comparin reference and optimized design. Furthermore, the inclusion of an aperature should deliver a much lower threshold current, as it has been observed in the past. Figure 4: Different device topologies (left) reference microbridge (right) optimized microbridge cross section showing (top) modal gain and (bottom) electrical hole current computed after inserting doped Si contacts using artificial phase fields. S. Hittmeir, J. Haskovec, P.A. Markowich, A. Mielke, Decay to equilibrium for energy reaction-diffusion systems, Submitted, (Matheon preprint, WIAS preprint 2233, 2016). M. Hintermüller and T. Surowiec, A nonsmooth approach for the optimal control of variational inequalities of the second kind. Submitted to Comput. Optim. Appl., 2016. M. Hintermüller and T. Surowiec, On the directional differentiability of the solution mapping for a class of variational inequalities of the second kind. Set-Valued and Variational Analysis, 1-12, 2017. M. Hintermüller and T. Surowiec, A bundle-free implicit programming approach for a class of elliptic MPECs in function space. Mathematical Programming 160.1-2: 271-305, 2016. M. Hintermüller, T. Surowiec, and A. Kämmler, Generalized Nash equilibrium problems in Banach spaces: Theory, Nikaido-Isoda-based path-following methods, and applications. SIAM Journal on Optimization, 25(3):1826-1856, 2015. D. Peschka, Numerics of contact line motion for thin films. IFAC, 48(1):390-393, 2015. (Journal of Computational and Theoretical Transport 45, pp. 410-423, 2016), (WIAS-Preprint 2180, Matheon preprint). T. Koprucki, D. Peschka, M. Thomas, Towards the Optimization of On-chip Germanium Lasers. In: WIAS Annual Research Report 2015. Th. Koprucki, and Th. Schroeder, Modeling of an Edge-Emitting strained-Ge laser. In: Proceedings of "Advanced Solid State Lasers 2015", OSA Publishing. 13(1):537-540. 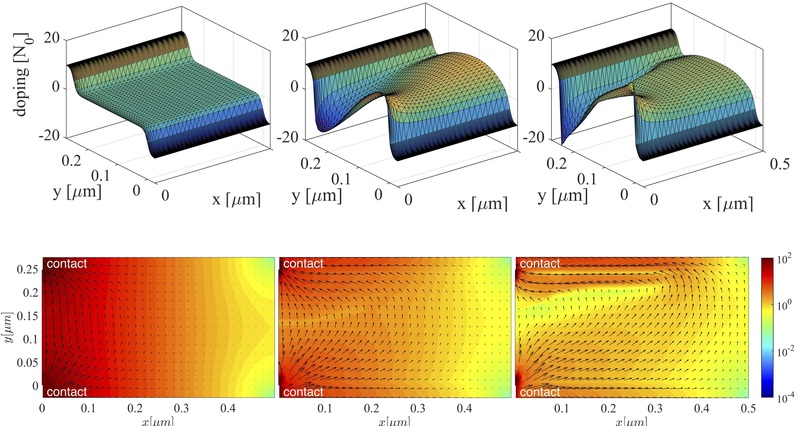 Robustness analysis of a device concept for edge-emitting lasers based on strained germanium. Optical and Quantum Electronics Journal, 48:156, 2016. [R1] Bandelow, Gajewski, and Hünlich. Fabry-Perot lasers: Thermodynamics-based modeling. Optoelectronic Devices. Springer New York (2005). [R2] Virgilio, Manganelli, Grosso, Pizzi, and Capellini, Radiative recombination and optical gain spectra in biaxially strained n-type germanium. Physical Review B (2013). Invited Talk (SS-02): Analysis and optimization for edge-emitting semiconductor-heterostructures. Talk (SS-68): From adhesive contact to brittle delamination in visco-elastodynamics. Invited Talk: Coupling rate-independent and rate-dependent processes: Delamination models in visco-elastodynamics. Talk: Nonsmooth PDEs in material failure -- Towards dynamic fracture. Talk: Towards the optimization of on-chip germanium lasers. Invited talk: A multi-material phase-field approach for the optimal design of a Ge-on-Si microlaser. Talk: Modeling, analysis, and optimization of germanium-lasers. Invited talk: Optimal design of a germanium-on-silicon laser. L. Adam, poster: Optimal design of a Ge-on-Si laser aperature via a multi-material phase field approach. M. Thomas, invited talk in minisymposium (MS-Mo-D-56): Analysis for edge-emitting semiconductor heterostructures. M. Hintermüller, talk: Optimal Control of Multiphase Fluids and Droplets. M. Hintermüller, talk: Non-Smooth Cahn-Hilliard/Navier-Stokes Problems. M. Thomas, talk: Modeling of edge-emitting lasers based on tensile strained Germanium microstripes. D. Peschka, invited talk in MS10: Numerics of Contact Line Motion for Thin Films. M. Thomas, talk: Germanium lasers: Towards the optimization of mechanical strains and doping. T. Surowiec, talk: Nonsmooth analysis and implicit programming approaches for optimal control problems governed by variational inequalities of the 1rst and second kind. M. Hintermüller, plenary talk: Optimal Control of the Cahn-Hilliard System with Non-Smooth Homogeneous Energy Densities. D. Peschka, invited talk: Modeling of suspension flows and its benefit for undergraduate studies. M. Hintermüller, invited talk: Shape and Topological Sensitivity Based Methods in Tomographic Reconstruction and Image Segmentation. M. Hintermüller, plenary talk: Generalized Nash Equilibrium Problems in Banach Spaces. organized by N. Rotundo, P. Farrell, D. Peschka (all WIAS). organized by M. Thomas, E. Rocca (all WIAS). 11th AIMS Conference on Dynamical Systems, Differential Equations and Applications (Orlando, US): Special Session Rate-dependent and rate-independent evolution problems in continuum mechanics: Analytical and numerical aspects. organized by H.-C. Kaiser, A. Mielke, J. Rehberg, E. Rocca, M. Thomas, E. Valdinoci (all WIAS), D. Knees (U Kassel). organized by D. Wegner (HUB) and M. Hintermüller.